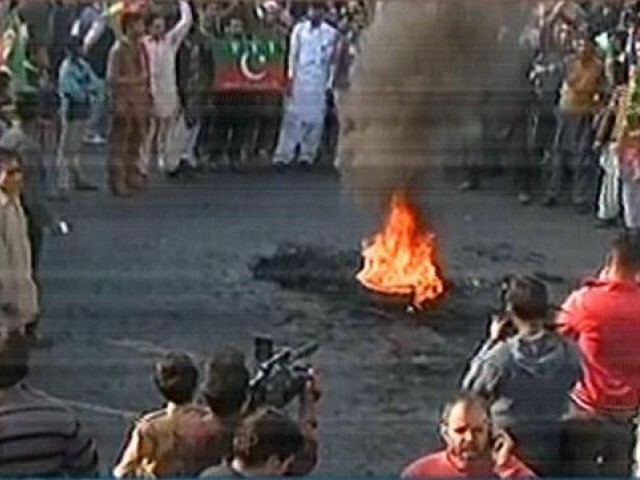 Faisalabad – December 8, 2014. PTI had announced to exercise its democratic right of protest by giving a “shutter down”. Punjab administration had started to manage things proactively and additional measures to keep law and order in place were being taken. For example; water cannons were brought from Sindh. I reckon that Punjab police had its CID or other sensitive department’s personnel deployed as well. I also fancy that some intelligence agencies under home department, or otherwise, would have their officials deployed, acting surreptitiously to capture anyone who tries to sabotage the law and (or) report the exact situation to Head Quarters. Regardless of my optimistic imagination regarding Punjab Police’s safety and security measures there is something evident that numerous policemen were deployed in Faisalabad on That day. The pictures and footages which aired on electronic media and published on print media, show serried rows of police in the background of persons with guns in their hands with clear intentions. The faces of those coward ruffians are as clear as day light, holding pistols and sticks, courtesy presence of media at the spot. Now after the fateful incident of Faisalabad, where one partisan of PTI was killed, my question is; why is it so hard for our police to capture the culprit and bring him to justice which is prerogative of citizens of Pakistan under the law and constitution. First failure was when police didn’t intervene during the affray between PMLN and PTI workers. It seems those people with weapons in their hands killing PTI worker were under auspices of police because it failed to stop the firing which resulted in the death of an innocent civilian. Now second failure is the dilatory strategy of police in capturing the culprits and producing them in front of court. Police just cannot absolve itself in this fiasco to keep law and order and just rely on the efficacy of NADRA to advise the whereabouts of persons involved in crime? Is our Punjab police that incompetent that it cannot identify the persons involved in crime when officials were present at the spot? I am layman but even I can tell, if police has the will, it can resolve the murder case of Haq Nawaz only from information by cops present at the crime scene and reports from intelligence agencies as I hope that, their job is not limited to only advise the number of people present at a certain Jalsa, to media. One can, rightly, argue regarding possibility of political pressure on administration. Even, if someone is pressurizing the law enforcement agencies, then whose job is to rebuke? Or Punjab police has found an easy way out to get itself subjugated by despotism of law makers? If so, then on which wall should I throw the law, constitution, hope and ethical values? Is Jinnah’s advise to bureaucrats with tenor to keep themselves aloof from politics was only meant to be promulgated in official papers, written in bold in text books and then make fun of it by acting like personal servants of some political party ? If so then, no wonder, this pandemonium in Pakistan will continue for next century also. Where constitution is flouted and law enforcement become a party, even the last ray of hope turns bleak. A few days ago, an American school teacher was killed in Abu Dhabi in a shopping mall. The assassin was identified as a ‘burqa’ clad individual. Police didn’t even know the gender of the killer at that moment but the mystery was solved and culprit was captured within 48 hours of the incident. This only achievement of Abu Dhabi police is enough to put Punjab Police’s name in hall of shame when I compare it with the Faisalabad incident where the police was present and media showed the face of alleged killer as well, yet he was able to flee the crime scene and still remains at large. There are only two scenarios. Either Punjab police is incompetent or is a party to crime. There is no excuse in presence of hundreds of cops and media to not to capture the culprit. I don’t blame any political party because this is what the politics of subcontinent is. Need of the hour is stand against tyranny and not to become part of it. PTI claims that PMLN worker(s) killed its partisan, Haq Nawaz. I refute. He was not killed by any party’s worker but he is killed and his family members are being and shall be psychologically killed by politicized police of Punjab in a display of contemptible cowardice and incompetence.